According to a Central Park-related web-page, "Like all of the other water bodies in Central Park, Turtle Pond is man-made, filled with New York City drinking water. 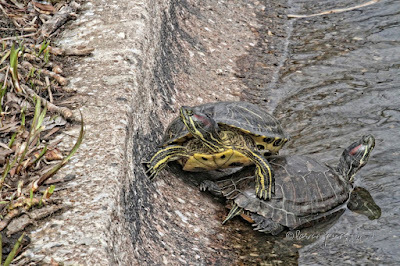 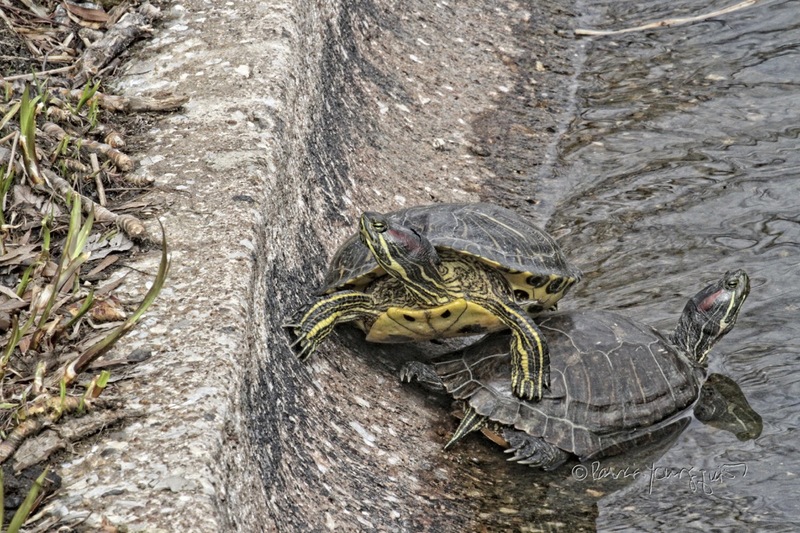 It is the home to five species of turtles who live in the Pond year round. 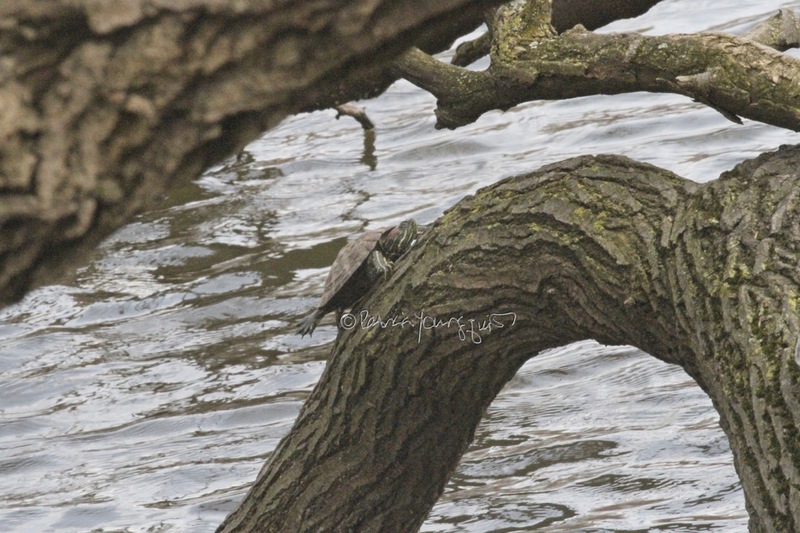 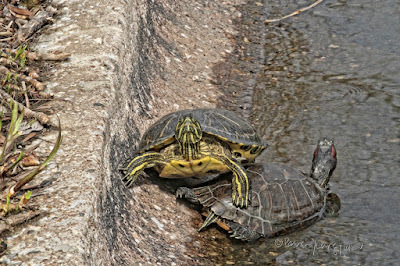 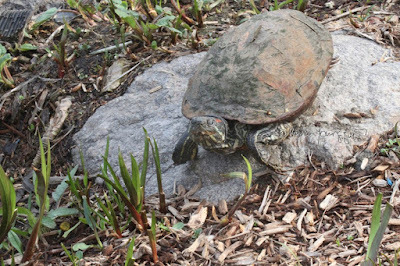 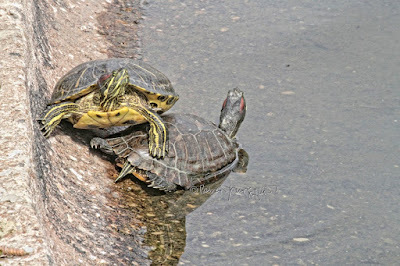 It is said that many of these turtles started out as pets in city apartments, but eventually outgrew their urban accommodations, and were brought to the Park by their former owners. 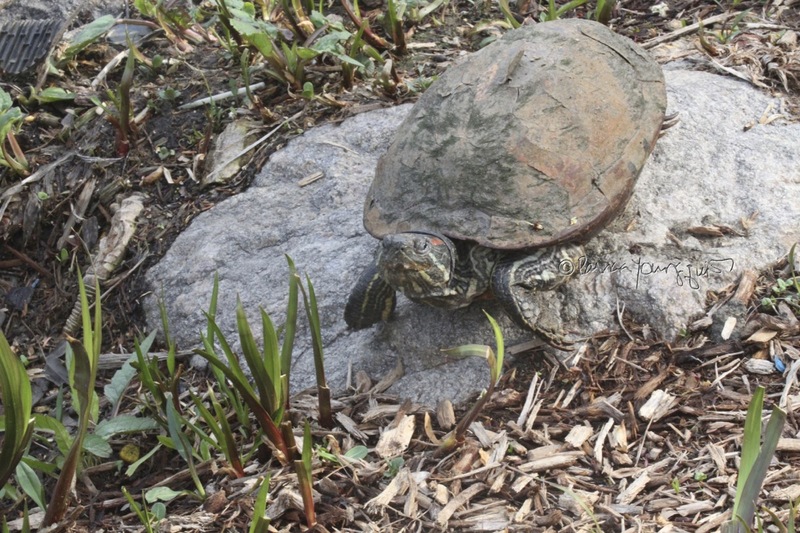 The most common species in Turtle Pond is the Red-Eared Slider, which you can identify by the small red spots around their ears. 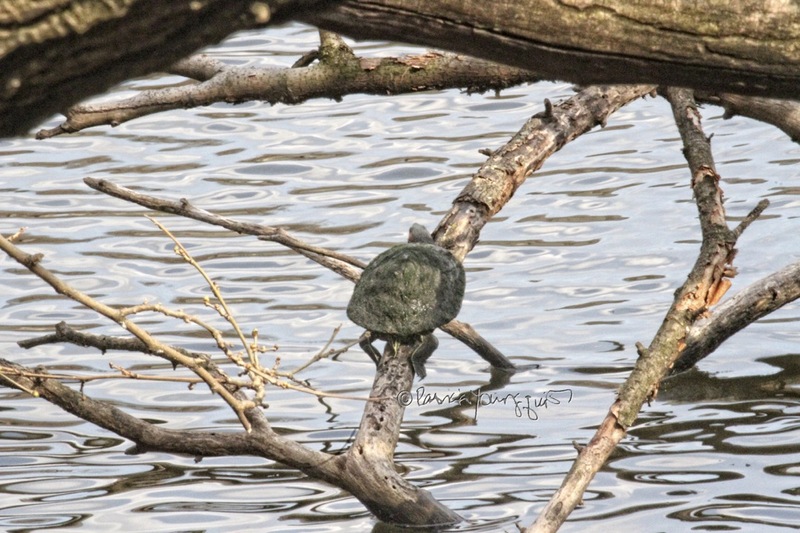 They love basking in the sun on flat logs or rocks, which makes the base of Vista Rock the perfect spot for their sun bathing activities. 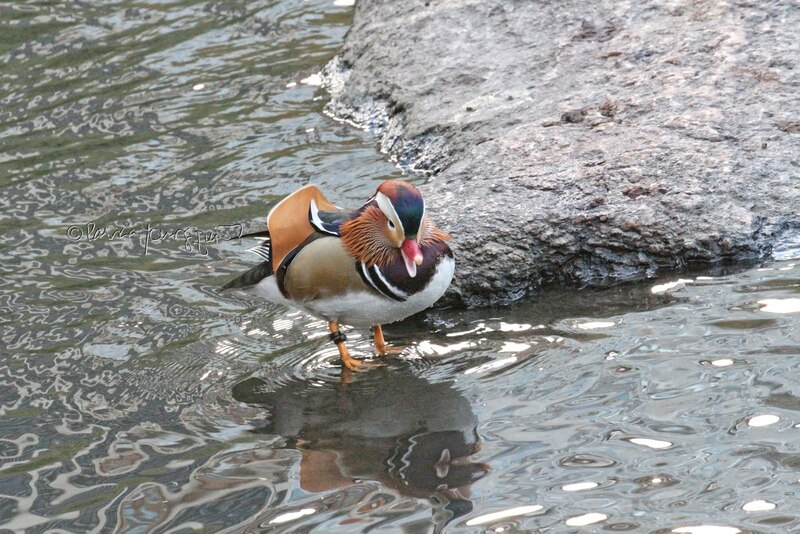 When the sliders are provoked, they quickly slide back into the cool waters of the Pond. 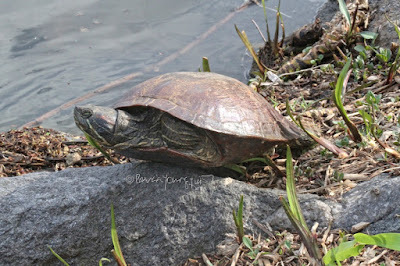 Turtle Pond has the distinction of being the most recent water body added to the Park's design." 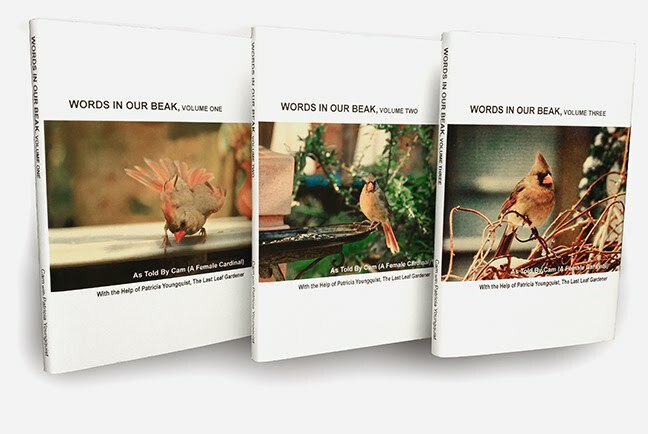 As you've just read, "they love basking in the sun" (as seen above) and "on flat logs or rocks" (as seen below). 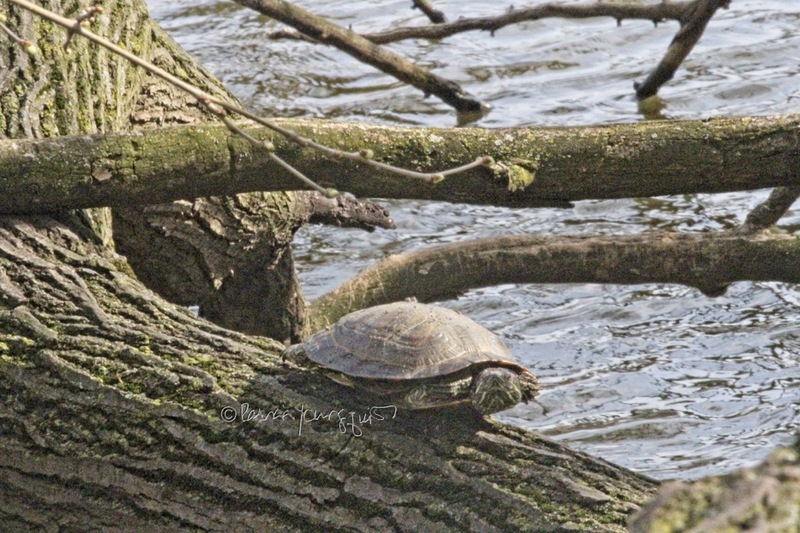 Over my many years in NYC, I've seen turtles catching their rays from these vantage points, but yesterday, I saw them avoiding the intense sun (it reached eighty degrees, a little too warm for the second week of April) by taking shelter in nearby trees; as evidenced in the following images. 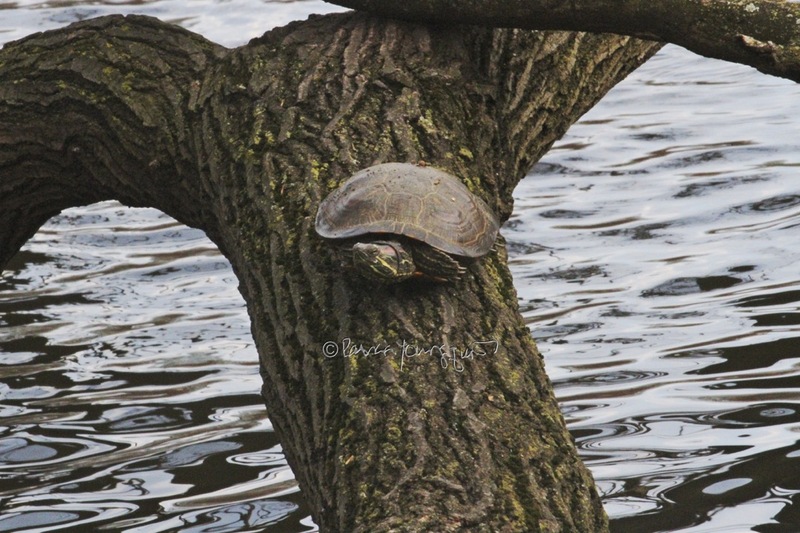 Passers by joked that they knew money didn't grow on trees but never thought if turtles grew on them! Those creatures had to be pretty adaptive and tenacious in order to avail themselves of the shelter from the sun that branches can provide. 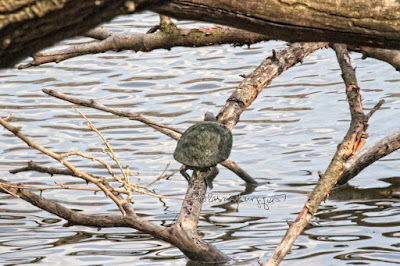 But the resilience of this animal hardly surprises me. 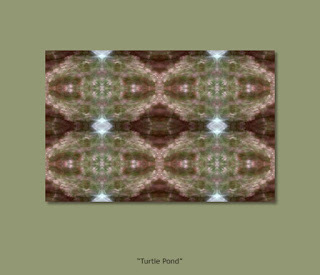 For years their shells have been an inspiration to me, and one of my kaleidoscopic photographs known as Turtle Pond is based on their patterns. 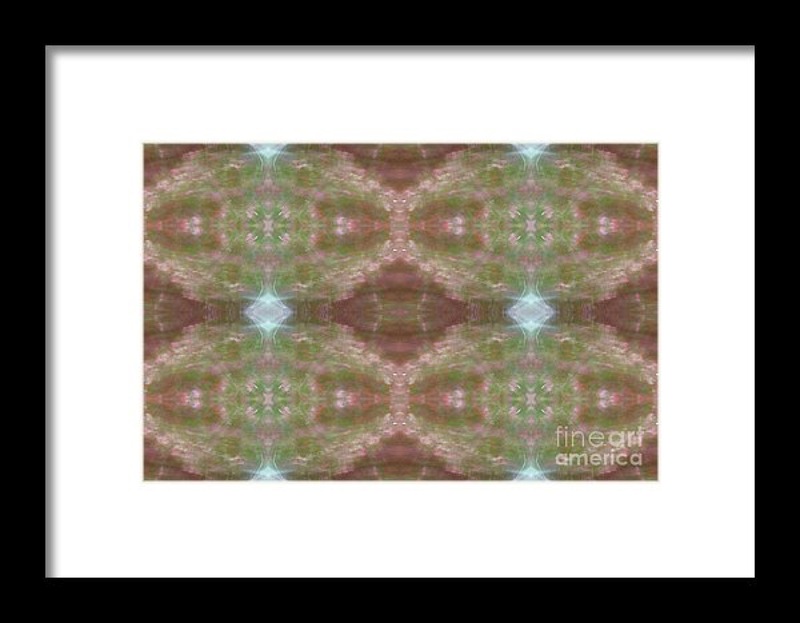 It can be seen in a gallery on my website (patriciayoungquist.com) and a miniature copy of it is posted below. 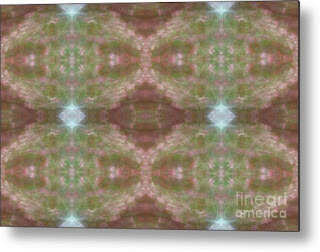 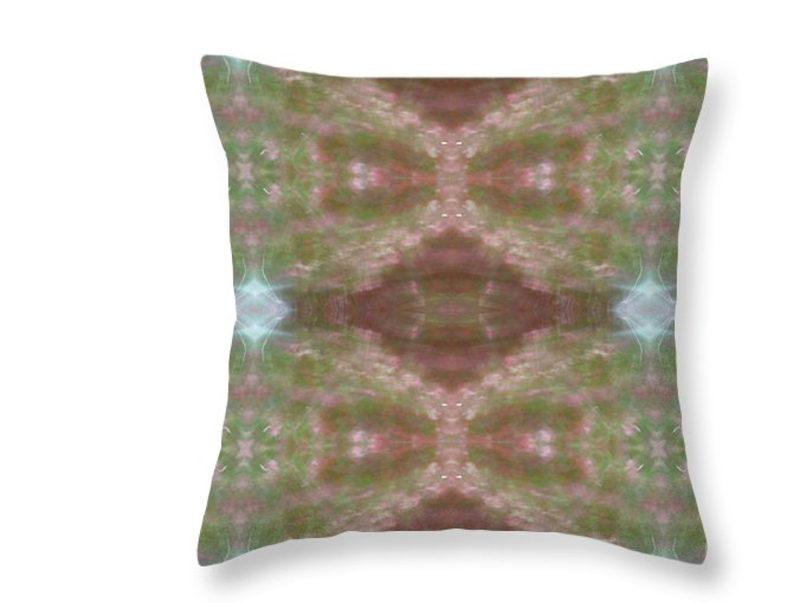 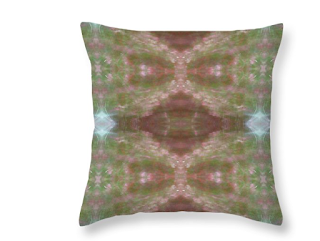 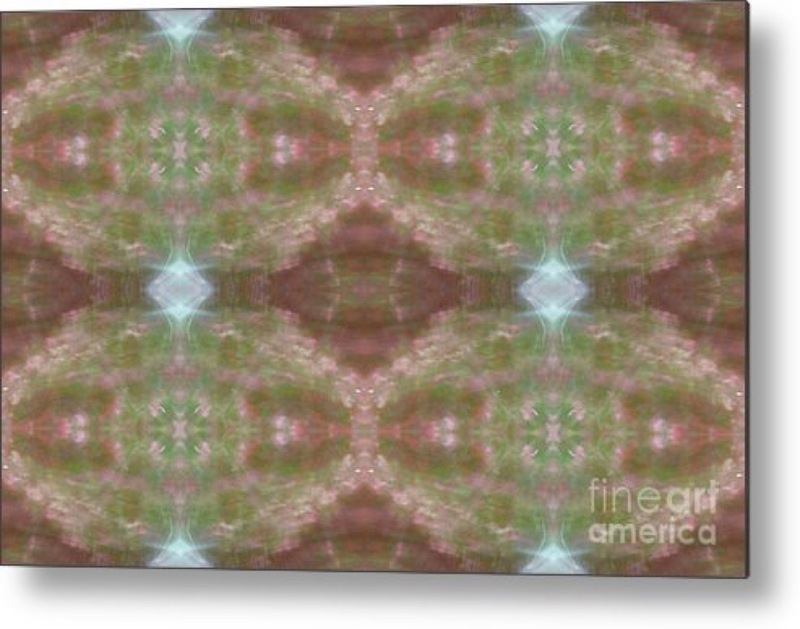 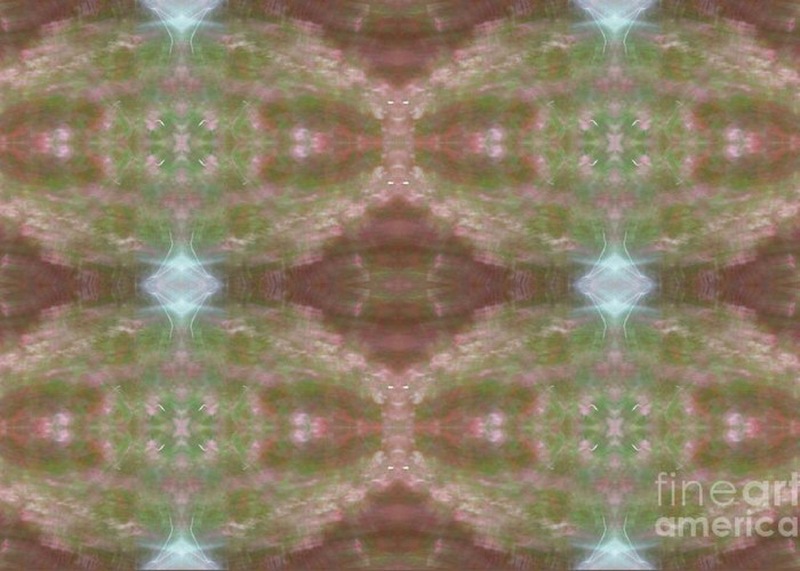 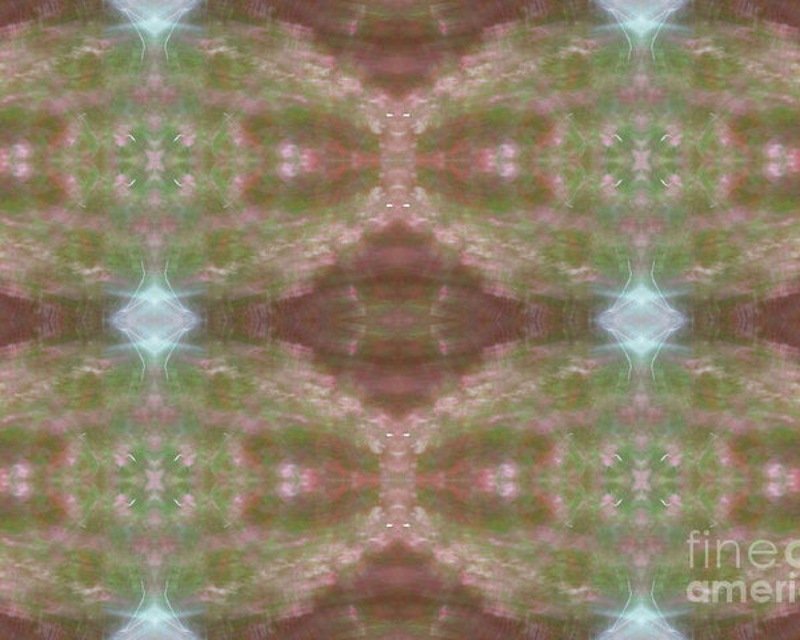 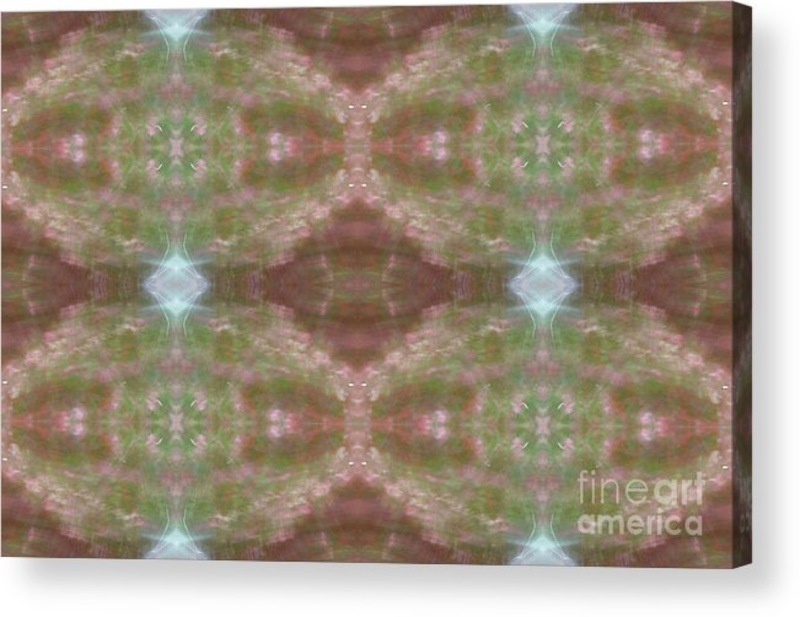 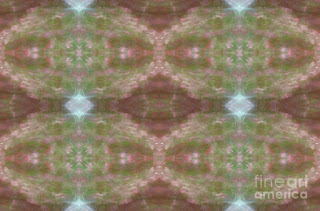 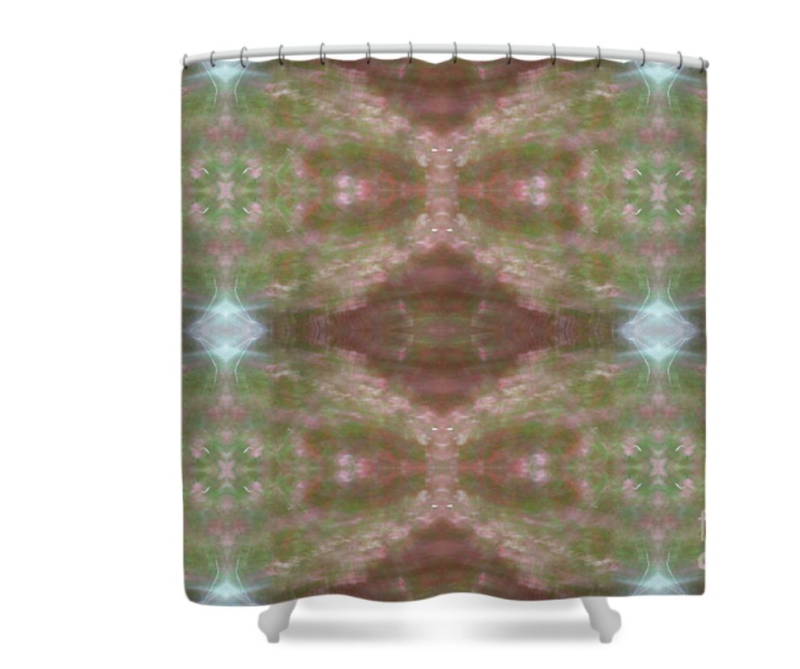 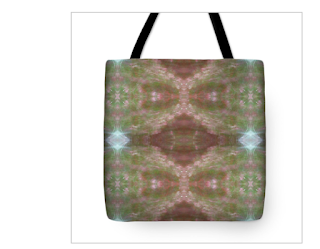 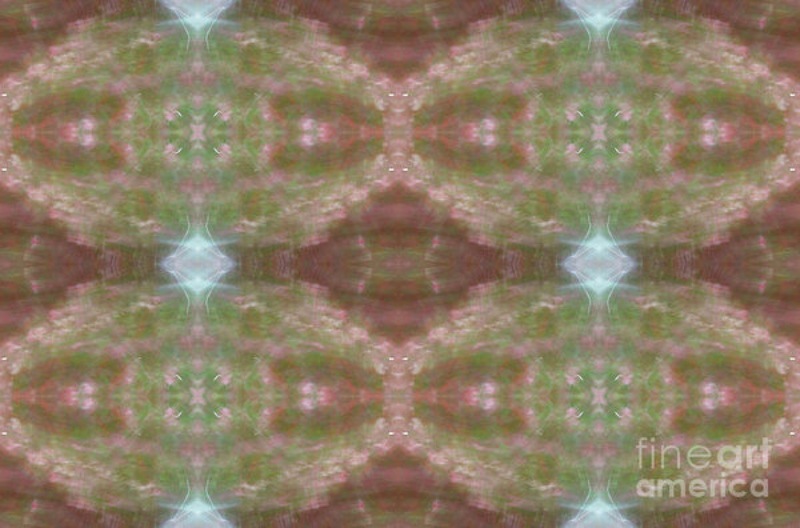 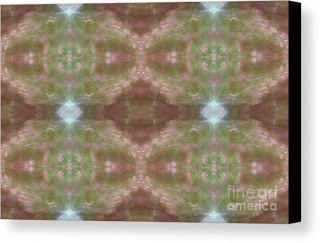 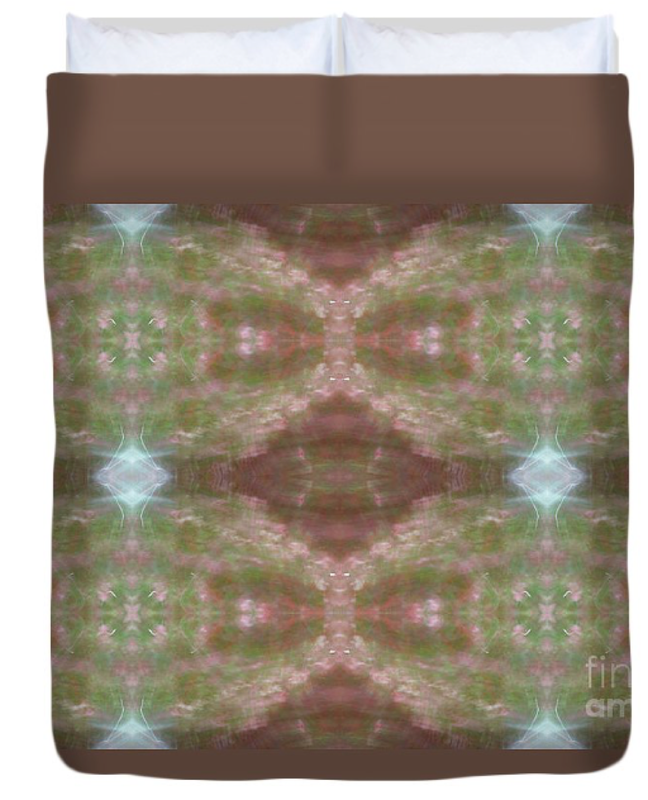 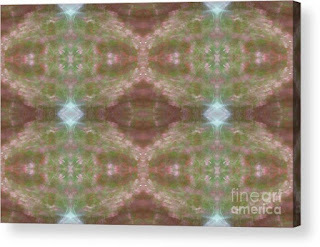 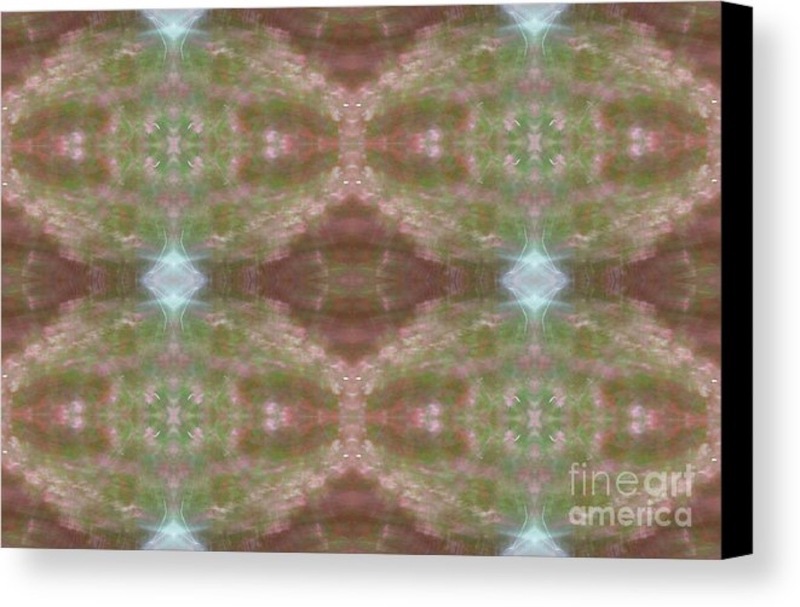 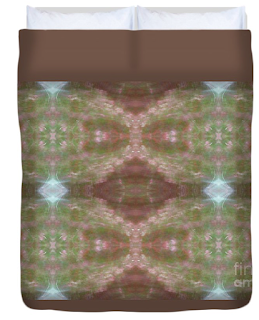 Moreover, this image is included in my kaleidoscopic collection on Fine Art America (FAA) and they can print it on an array of surfaces for wall art as well as on to items for home decor and personal use. 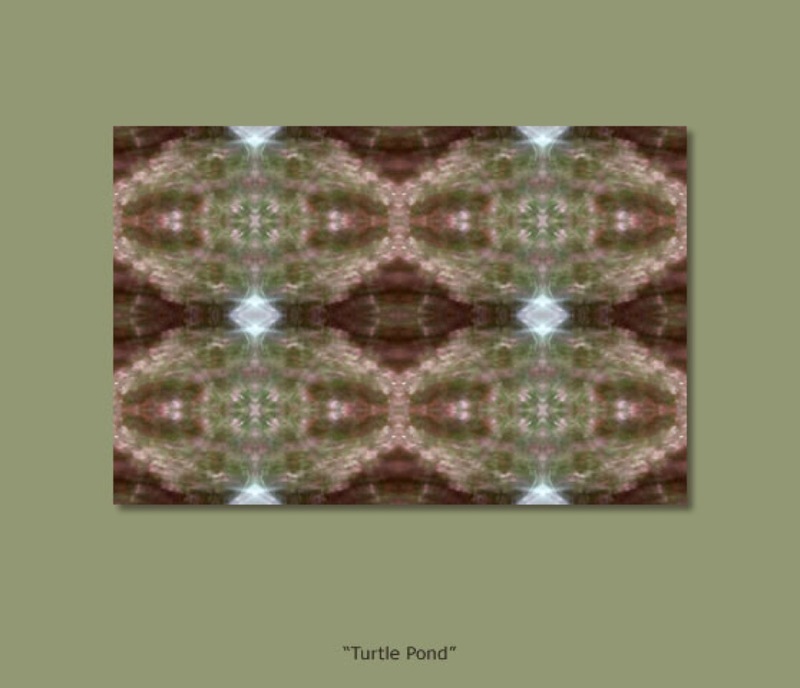 Examples of ways FAA can render my Turtle Pond print can be seen below, but please visit my gallery to see other options as well as my other kaleidoscopic images.